mom-preneurs, neither one of them thought they’d walk out with more than what they walked in with. Not just a business, but a multi-million dollar business -- based on an idea that pretty much all of us may have had at our fingertips over the years. It all began with Cris’s three kids, and Kirsten’s four, and the nearly 2000 plastic Ziploc bags the two stay-at-home moms used every year simply packing school lunches. Cris, who had worked in international law, and Kirsten, an environmental consultant, had traded in their high powered positions for field trips and PTA fundraisers. Neither of them was thinking about returning to work any time soon. But as they sat in that circle, they began brainstorming about what they might do, if one day, they actually wanted to start a business. “But we’re both pretty type A,” Cris said with a grin. “So, if we were going to do something we were going to find a way to make it work in a big way. We thought we’d present the products at the auction, and then maybe develop a fundraising program the school could opt into for the following year. So the women went to work, scanning the internet for products that could help families go green. They found food wraps that opened up into place mats, pencils made from recycled newspapers, even a reusable paper towel. But there was little available that could replace those plastic lunch bags -- bags that Moms around the country were using millions of, and kids were simply throwing away. And that was their "aha" moment –- the moment they realized they were sitting on a million-dollar idea. “We found one,” Cris said, “but it was kind of like vinyl and didn’t feel great around your food. And we thought, how can we improve this? How can we make a better reusable baggie? And then, early one morning, with her family still sound asleep, Cris went back to the internet and saw a picture that sealed the deal. It was a pastry bag, the kind that bakers use to frost cakes, made from a fabric that could withstand high heat and was clearly food safe. She picked up the phone and called the manufacturer. After making sure they signed a non-disclosure agreement, she revealed their big idea. And the company not only bit, they offered to help bring it to life. With the fabric and production in place, all the women needed was to bring a little color to their bright idea, so they recruited one more mom, Cris’s childhood friend, Jennie Stoller Barakat, who’d grown up and become a graphic designer. 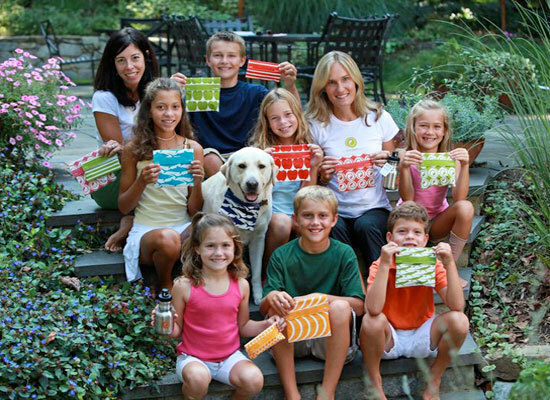 They named their product LunchSkins and their company 3GreenMoms, thinking that the reusable lunch bag would be just one of several products they’d sell in their fundraising kit. But they quickly found out, that they’d created something parents were hungry for. And that’s, unfortunately, when the partners found out that the deal they’d made was far from airtight. The partners re-grouped and began searching for a better solution. And once again, it came to them when they weren’t actually looking. Cris was at a wedding and seated across from another mom who had put her own product into production. With their production problem sewn up, the women moved to their next piece of business -- building a website, which they did at Cris’s kitchen table. They saw the website as a way to build credibility. It was only as an afterthought that they decided to add a shopping cart. And people wanted to do more than just buy a few bags. Once Mommy Bloggers got wind of the fresh idea, they couldn’t write enough about it. And then there was an email from O Magazine. The moms, who began with an idea for a school fundraiser, were about to make the coveted O list. Moms had spoken. They clearly wanted a fun way to go green. And that gave the three friends the confidence they needed to move into even bigger arenas. They took their multi-colored creations to Expo West, a trade show that draws retailers from around the world. And there, they not only began drawing attention, LunchSkins was the runner up for Best New Product -- coming in only second to Chobani yogurt. Today, four years from the time the 3GreenMoms launched LunchSkins, they have sold more than one million of the reusable snack and sandwich bags and they’re on the shelves of retailers like Target and The Container Store. And that’s just the beginning. Now the accidential mom-preneurs are taking on lunch totes and napkins -- hoping to make an even bigger dent in the 67 pounds of lunch-time trash the EPA says one child generates in just a year. “Neither of us was thinking about starting a company,” Cris said. “It’s like having a baby,” Kirsten added, “there’s never a perfect time”. The whole crew assembles to show LunchSkins some love. Combined, Kirsten and Cris have seven children! Kirsten's dog Cooper, the company mascot, joins in on the fun.